The announcement was made by Solomon Islands Football Federation (SIFF) president, William Lai, in a specially called press conference held at the SIFF academy on today. Lai also named Gideon Omokirio as the assistant coach. In making the announcements Lai said that SIFF is looking towards the next generation of Solomon Islands coaches to deliver for the country at the international level. “This appointment is about giving the responsibility to younger coaches who have the potential and the drive to lift Solomon Islands football higher – the old generation has played its part and now we need youthful minds and dynamic personalities,” Lai said. Lai spoke highly of Toata saying that he has a proven track record and is one of Solomon Islands best coaches and that SIFF is privileged that he is willing to work with our national team. “We have seen Toata perform in our national league and he has also done well internationally. We believe that is the best local coach we have and the best candidate for the job ahead,” Lai said. Toata says that the decision to take up the role is not an easy one for him because of the responsibility associated with being the national coach. “It has taken me some time to decide whether to accept this position because it is a big role. For me this role is one of responsibility and also of opportunity and I look forward to working with SIFF and other parties for our national team,” Toata says. It was outlined that the initial mission for Toata and Omokirio would be to lead Solomon Islands against Fiji in their upcoming tour planned for November. Beyond that, it is hoped that the duo will take the country to the Oceania Football Confederation (OFC) Nations Cup in 2016and the 2018 FIFA World Cup Qualifiers for Oceania. Toata is a former national player and has played with KOSSA in his playing career where plays as an attacking midfield. 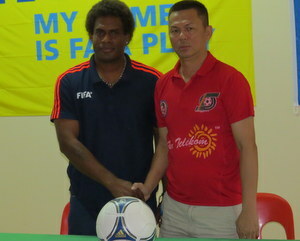 He started coaching with KOSSA in 2011 but later moved to Solomon Warriors where he has led them to two national league titles in the Telekom S-League and participated twice in the Oceania Football Confederation (OFC) Champions League as well win two back to back Melanesian Super Cup titles in 2014 and 2015. Both Toata and Omokirio are currently undergoing assessment to qualify for OFC B-Licence coaching certificates – only two other local coaches are undergoing the same training. The duo also received training under the English FA coaching programmes including having attended FA coaching clinics in England.